Happy #TravelTuesday one and all! I’m Dave Williams, coming at you from Tallinn, Estonia where I’m exploring this old city in search of coffee, burgers, and awesome views! This week, I have a secret tip for your drone photography. When people get a drone they go through actions not dissimilar to when they get a window seat on a plane. What us humans tend to do is take a photo of that place down below us, familiar to us, from a new perspective. We get on the plane and, as it takes off over our local city, we see things we recognise out of the window and shoot them for the sake of shooting them. It’s not a bad thing; I’m not saying that at all. If anything, it’s pretty cool to get that new perspective of such a familiar place and to see how things look relative to one another from up there. It’s tantamount to what we all did when we first discovered Google Street View—we suddenly had the technological ability to literally go anywhere we wanted in the entire world and despite that, we all did the exact same thing. We opened up the map, we took hold of that little man, and we all dragged him and dropped him into the exact same position: our front door! We like to see things from a new perspective; it’s clearly in our nature. This little trait we all seem to have rubs off in our drone photography and we need simply to be aware of it in order to avoid it. When flying a drone, as I’ve explained in my KelbyOne class, we need to fly like a movie director. This means not simply lifting off and turning the camera to view the place we took off from. It means applying all that we know about photography, such as light, composition, and subject matter, and applying it to the new camera up in the air. It’s simply another camera, which is now removed from us—the same rules and principles apply. Don’t be the passenger in the window seat. Make your drone photography stand out among the crowd. Above: That’s me during my book signing at the Rocky Nook booth at the Expo. Met so many really nice photographers. Erik Kuna and I up are here for the Expo (PPA’s annual convention) and while we’re here, we thought we would give KelbyOne members a tour of the expo floor; check out some of the booths, and share the sights and sounds of the Expo. The first three videos are our three-part tour of the Expo floor and booths, and then we asked some exhibitors to quickly show us what they’re showing at the those, and those are the 2nd set of videos. Now below, here are some of those exhibitors (and our partners) showing what they’re showin’ at the show (that’s a lot of ‘shows’). We’re back at the show today! I’m heading back home tomorrow, and then I’m taking a few days off to visit a friend up a Canada; hang out, and take some pictures in the snow-covered mountains of Banff. I’m going to dress very warmly! Have a great Monday, and here’s to staying warm this week! In the Photoshop CC update Adobe released in December, they added a new feature that I’ve been begging for, for years and I even got to nudge it along a bit. “Here’s the idea: I have a multi-layered document. All the layers I want are visible. There are some layers I turned off during the design stage. I flatten the image, and I get a dialog box asking if I want to also discard the hidden layers. Of course I do — otherwise, they wouldn’t be hidden. In fact, I never want a flattened image with two or three layers on top that I’m not using and are hidden. So, what’s missing? A “Do not show again” checkbox in that dialog. Back in November, I got an email from one of the folks on the Photoshop team to let me know this checkbox would be in the December Photoshop CC update (and that’s it above, in the current version of Photoshop CC). I was thrilled when I heard, and now that it’s here, even more so. I’m excited to be heading to Banff National Park right after that to finally get a chance to shoot there in while it’s a snow-covered winter wonderland. No work, just fun. Can’t wait! Think differently about your business! Join Mark Heaps as shares tips and tricks for efficiency in Photoshop, while at the same time teaching you how to set yourself and your collaborators up for success. This class has two parts, and in the first half Mark demonstrates a number of Photoshop techniques to help you work smarter. In the second half he delves into more strategic concerns designed to help you grow your business, help you define who your customers are, learn key phrases and terms, and so much more. By the end of the class you’ll have a strong foundation for working as a great collaborator whether you are part of a team or an independent freelancer. Join Mia McCormick and John Keatley as they sit down to discuss the business lessons John has learned from his career as an advertising and celebrity portrait photographer. 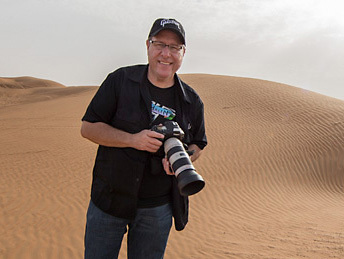 John has photographed celebrities, athletes, and politicians, and his work has appeared in publications ranging from Rolling Stone to Wired. Over the course of an hour John and Mia discuss topics ranging from developing a business frame of mind to knowing your costs before entering negotiations, and from the role of social media to how to demonstrate what you can do in an engaging way, and so much more that will help you accelerate your business today. I was recently watching a tutorial on advanced product retouching in Photoshop, during which the instructor spent an astounding amount of time removing imperfections and isolating every element to its own layer. It was eye-opening, but not in the way I expected. During my career I’ve captured a client’s or art director’s vision on a two-dimensional plane with lighting, subject matter, resolution, and camera angle baked-in forever. This had me looking for another way to approach image and motion creation. Here I’m on location capturing overhead shots of foliage to be used in SpeedTree to re-generate the plants in the 3D realm. I capture a naturally lit overhead shot as well as a back lit shot to tell the 3D program how the texture is to look when back-lit. During a recent series of trips to New York, I found myself with quite a bit of downtime in the evenings which allowed me to dive headfirst into the world of 3D. 3D is nothing new, but as of late the software and hardware is advancing at lightning speed, and I noticed that it wasn’t being used in generating food imagery nearly as much as it should. In order to use 3D in production as a food photographer, I needed to become adept at modeling, texture creation, photogrammetry, VFX, compositing, and sculpting. Not an easy task and as many know, but the learning never ends! This entire scene was modeled, lit, and rendered in around 30 minutes. The scene still has that overly-slick 3D look so blending in grunge maps and other imperfections to the scene works wonders. This scene was lit with what’s known as an HDRI map with is essentially a spherical panorama of a location that is used as the lighting source. My current software workflow includes Modo for hard surface modeling, Substance Designer and Substance Painter for texture authoring and painting, Zbrush for sculpting 3D meshes, Reality Capture for photogrammetry, SpeedTree for foliage generation, Marvelous Designer for fabric, Houdini for VFX, Redshift for rendering, and of course Photoshop for the final touches! For organic objects, nothing beats photogrammetry! To create this oyster asset, I shot the oyster on a Lazy Susan from every angle possible and stitched the images together in Reality Capture. The resulting 3D mesh is then cleaned up in Zbrush and the color texture is cleaned up in Photoshop. My favorite breakthrough in 3D and one that doesn’t get nearly enough focus in 3D software development is VR. I currently use MODO for modeling, and they recently implemented a VR viewport allowing the user to physically enter the 3D space. This is important as I’m used to moving around a physical subject and my hope is eventually to be able to conduct a virtual photo shoot live within this realm. What I love about 3D is that anything becomes possible and the food on set never goes bad! The strength of 3D lies in the ability to create any photorealistic environment you want and change anything from lighting to export resolution forever. Learning 3D also makes you a better photographer. Photographers always tout their understanding of light, but it took me all of two minutes learning PBR material authoring to realize I didn’t know squat! Rendering realistic objects is challenging and render times increase as the light complexity increases. I will often test techniques in isolation such as caustics and light bounce counts. I use Redshift for nearly all of my rendering needs and I tend to render out EXR files which contain the various “passes” needed for post-production. This process separates depth, luminance, puzzle matte, roughness, albedo, emission, sub-surface scattering, and other passes so that each element can be manipulated separately in Photoshop or After Effects If the export is for motion. Material authoring is addictive but time-consuming. There are many 3rd party sources that provide a variety of base materials such as these to get your started. As much flexibility as 3D offers, every still image render ends up in Photoshop where the final creative touches are applied. Having a strong knowledge of Photoshop, lighting, camera operation, etc. gives photographers a strong starting point to learn 3D. The more I progress in adding 3D to my wheelhouse, the more I realize that this hybrid approach to image creation will soon be a requirement for emerging photographers. Every material applied to objects is a series of tiles, typically 4-8k square in resolution. To apply a texture to an object, it often needs to be “flattened” by creating a UV map. This bizarre image is a world space normal of a UV flattened Buddah’s Hand Fruit. There’s an enormous amount of information to take in when learning 3D, but hopefully this will help you know where to begin when adding 3D to your image creation wheelhouse. You can see more of Steve’s work at SteveHansenImages.com, and keep up with him on Instagram. Welcome to another #TravelTuesday here on Scott’s blog. I’m Dave Williams, and I’m here weekly, writing for you. Light is something you should be seeing as a photographer. If you’re not, just keep practicing and practicing and, eventually, it will just click one day and you’ll see it. Today, I want to explain what a difference it makes to landscapes and how to apply it. Photography is the art of portraying light, right? Using light to make the subject, the model, the landscape, look its absolute best is the art form we love. In the process of learning to see light, there are many techniques we can employ, but the important thing is to keep the end goal in sight. Photography is subjective and we want people’s interpretation of our photography to be that it’s beautiful. To do this, we need beautiful light on our subject, whatever our subject may be. Without light, there are no photographs – it’s that important. Seeing light is the key skill that will come one day through practice. Through reading, through watching tutorials, through shooting in different conditions, and learning what changes each time, it all contributes to us learning to see light. Not to “see,” don’t misunderstand – to “see light.” Ways to practice seeing light often don’t involve photography at all. Noticing subtle differences caused by different temperatures of light cast at different times of day, through different natural filters, and falling from different angles are all the things we need to pay attention to. Watching how it falls on our hand, on the faces of people around us, and how the shadows are cast, too, are all things to pay attention to and consider when we’re learning to see light. Relating to landscapes, visit a location time after time in different conditions and at different times, and you’ll see how the light changes the entire scene, changes colours, and even moves the scene somehow. The difference is dramatic and it truly makes such an impactive difference to see a photo with great use of light versus a snapshot with flat, dull light. There is, in most cases, nothing as good as using natural light effectively in portraiture, as well. The light cast from a well-filtered, softened natural source of light can make a subject really pop and evoke an emotional connection between the subject and the viewer, owing to the causal effect of good use of light and nothing more. Taking the time as a photographer to really concentrate on light and learn how to really see it will, if you haven’t reached that level, take your experience to a totally different place, and if you can see light just don’t stop practicing!